31Knots - "It Was High Time To Escape"
Man, I just cannot keep up with all the really interesting bands from Portland, Oregon. The promo sheet refers to "prog-pop", and by golly if that doesn't fit 31Knots like a glove. The band is a trio consisting of Joe Haege on guitar, piano and vocals, Jay Pellicci on drums and vocals and Jay Winebrenner on bass. Pellicci replaced drummer Joe Kelly, who plays drums on four tracks. "A Half Life In Two Movements" is a brief intro piece that begins with a Yes-like guitar/bass interplay before launching into a thrashier jam. "Darling, I" is next and introduces us to 31Knots' blend of alt-pop song and sophisticated progressive rock instrumentation. The vocals sound a bit like Jon Anderson, though they have a raw edge that is much more fit for the alt-pop stylings that dominate the song aspects of the music. "We Still Have Legs" features more of 31Knots' Yes-like instrumental constructions that somehow manage to fit, if not so comfortably, into the alt-rock realm. Love that vicious thrash-Goth-garage-metal jam at the end. "The Gospel According To Efficiency" and "At Peace" are highlight tracks that include lots of variety in a mere 4 minutes, with a combination of somewhat bland songs portions, thrashier rocking parts, and little excursions into 31Knots' more complex progressive rock tendencies. I made a reference to Jon Anderson earlier, but here the vocals remind me of the guy from Jane's Addiction. At just under 3 minutes, "No Sounds" succinctly demonstrates how much variety, creativity and thoughtful complexity can be constructed within a short song. A similar track and one of my favorites is "That Which Has No Name! ", a song which never stays still for very long, continually evolving through multiple movements, all within a few short minutes, and without feeling like the band are cramming too many ideas into too small a space. In summary, 31Knots do an impressive job of injecting life into an otherwise boring genre... and I hate the term alt-pop, but that's what I use to describe college-rock, indie-rock, and the dreaded alternative-rock, which is usually anything but. In short, this is a nice marriage of progressive rock and modern rock songs. Highbrowed... but with lots of dirt on their hands. 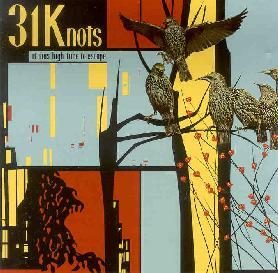 For more information you can visit the 31Knots web site at: http://www.31knots.com. It Was High Time To Escape is distributed by 54040' or Fight! You can visit their web site at: http://www.fiftyfourfortyorfight.com.